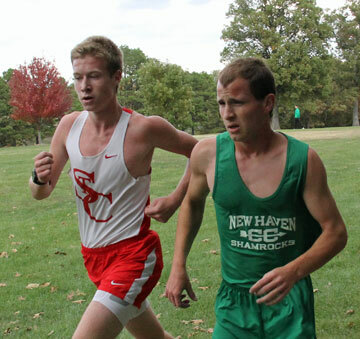 After finishing third at FRC meet last year, New Haven senior Seth Schenck shaved off 1.5 minutes to run away with a FRC Individual Championship by 20 seconds with a time of 17:05.24. Senior Fey Chavez’s career best time of 22:11.80, earned her All-Conference (Top 15 girls earn all-conference) honors for the second straight year, finishing 13th. One place better than last year’s 14th place finish. 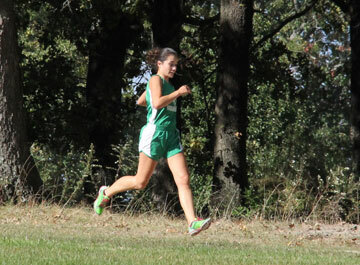 Pictured right: Fey Chavez passes the two mile mark and maintained her 13th place. 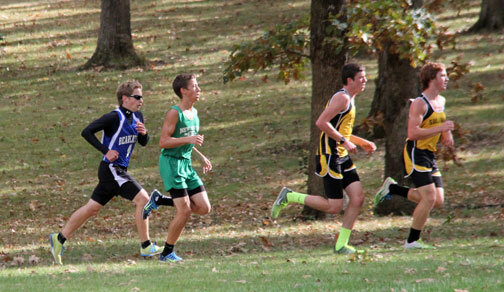 The Class 1 District 3 Cross Country Meet will be held in Westphalia on Saturday, Nov. 2. The girls will run at 11:40 a.m. with the boys running at 12:50 p.m.
Click here to download complete District Meet information. As always, Like Us on Facebook for more photos that can be downloaded for free.